Please everybody share this poster and message in your emails and on social media, and on any rabbit or pet group you might be on. 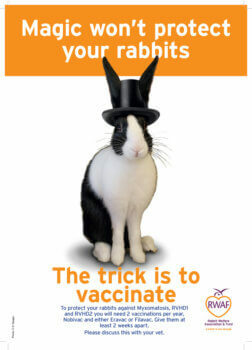 Rabbits need vaccination every year to protect them against RVHD2 as well as against Myxomatosis and RVHD1. Unfortunately that can’t be given in one jab. There are two. For Myxi/RVHD1 they need the Nobivac combined jab and then for RVHD2 there is a choice of either Filavac or Eravac. There should be at least 2 weeks between the jabs. We are actually finding that by sharing to general pet groups we are getting the message to new people who weren’t aware.